DeSantis and other Team in Training members pose with the team logo ahead of the race. (Photos courtesy of DeSantis). 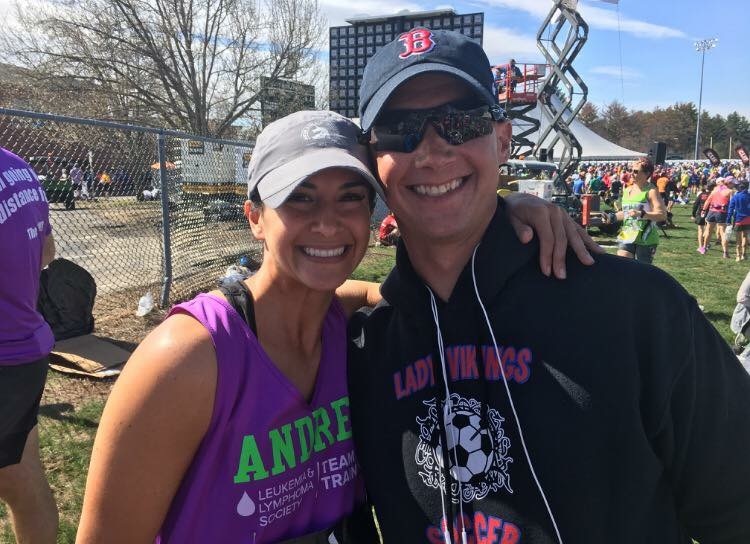 BOSTON — When Andrea DeSantis joined Team in Training to run the Boston Marathon five years ago, she knew she’d get to raise money for a worthwhile cause and participate in one of the most renowned road races in the world. She didn’t know she’d make lifelong friends as well. 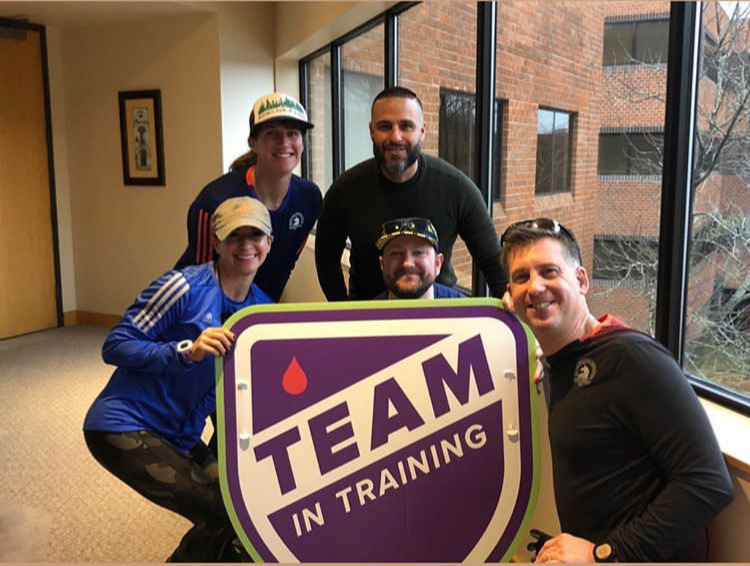 Team in Training, a charity team that raises money for the Leukemia and Lymphoma Society, has trained over half a million athletes and raised over $1.2 billion dollars to date, according to their page on the Boston Athletic Association website. With one year of running the Boston Marathon already under her belt, DeSantis was inspired to join after a family member lost her fight with leukemia. “My husband’s grandmother had passed away from leukemia, so I thought it would be a nice tribute to run in her honor,” she said. After that first year, she was hooked. Even when she was a new addition to the team, DeSantis said the veteran members went out of their way to make her feel welcome. This year DeSantis’ marathon run is inspired by Team in Training friend Timmy Harner (right), who ran the marathon in 2017 and 2018 after a fight with acute myeloid leukemia. (Photos courtesy of Andrea DeSantis). Now, the people she met that first year are some of her closest confidants. “We probably talk 10 times a day via text,” she said. Running with a team has also made DeSantis’ training process much more enjoyable and manageable, she said. As a 42-year-old mother of two young boys and a pediatric cardiology nurse at Boston Children’s Hospital, finding time to run can be challenging for DeSantis. But as a member of Team in Training, she’s provided with a training plan and people to help her through it. 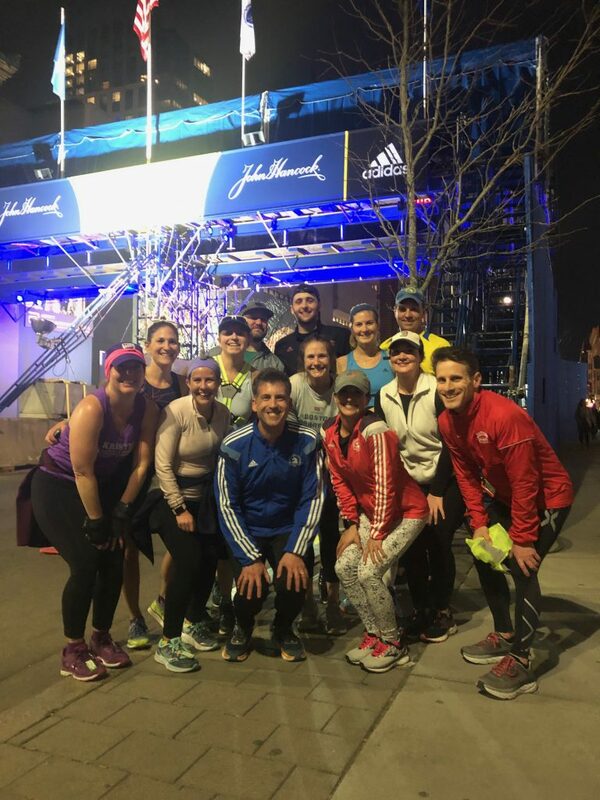 In addition to actually running the marathon, members of charity teams like Team in Training have to meet fundraising goals to support the organizations they run for. 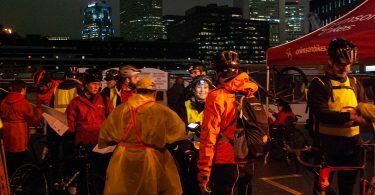 This year DeSantis set out to raise $10,000 for the Leukemia and Lymphoma society and surpassed that goal by $1,000. DeSantis is also raising money and running the marathon with another very specific goal in mind: to show support for one of her Team in Training friends who is taking the year off from running. DeSantis joined Team in Training five years ago as a way to honor her mother-in-law who passed away from leukemia. Now, she’s running her sixth Boston Marathon with a tight knit group of friends she met after joining the team (Photos courtesy of Andrea DeSantis). Timmy Harner ran the Boston Marathon with Team in Training in 2018 and in 2017, just one year after being diagnosed with acute myeloid leukemia. 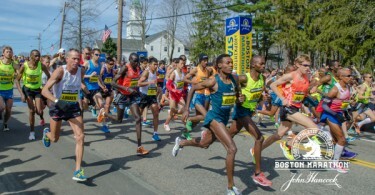 This year he’s taking a break, but DeSantis said he’s a big part of the reason why she keeps coming back to the Boston Marathon and to Team in Training. As a Foxboro resident and Waltham native, DeSantis has always known what an honor it is to compete in the Boston Marathon. But it’s not the renown that keeps her motivated. “I come back every year for the people,” she said. “All of my friends’ stories that I hear year after year about fighting cancer, their stories have become my stories.